Look, we’re all just get through childhood which leads to teenagehood which unfortunately transitions into adulthood. Once we become adults, we have responsibilities upon responsibilities, upon, well, responsibilities. While some people strive in adulthood (how?) most of us are just trying to keep our head above water. We’re just trying put one foot in front of the other while we long for the days when we could mooch off of our parents again. If this describes you, fret not, because this article is about people who made it to adulthood but should absolutely not be there. These are your peers. Enjoy! In the world of social media, everything revolves around how you make people perceive your life. Nothing is real anymore. Nothing. In the world of filters and cropping, you probably won’t even recognize someone you only see in pictures when you meet them in real life. If you’re less than 5’2, you should legally not be allowed in adulthood. Okay, now we’re talking. This is what it looks like when you’ve hit that age when fake IDs become the key to your weekend. There’s no more famous fake ID than the McLovin photo from Superbad. While it usually is an instant rejection at the club door, this guy just might have a chance. It’s pretty normal to flex your money on social media. If you don’t have money, you pretend you have money. You do whatever you have to do in order to make your peers think your life is better than theirs… even if that means putting a dinky car in a shower and taking close up pictures of it. Coming up, an underage girl got let into the bar, and I’ll leave it up to you to see if it’s that big of a surprise. This is one of the most heart-sinking moments of your life. You just lied about your skills to your boss, and now you’re thrown into the fire. You said you’re proficient in Excel even though you’ve never been on it in your life, and now you’re tasked with putting together a professional spreadsheet. Wouldn’t it be nice to pay $39 and get to be in the same graduation as someone who paid $100,000? In the real world, $39 wouldn’t even be able to pay for one page of a textbook. You can barely take a breath on campus for $39, not to mention actually walk across that stage and graduate. This girl is excited she got let into the bar, but she should be more excited that they didn’t give her the senior discount. Coming up, a picture that perfectly shows that a mother’s honesty is NEVER good. Driving luxurious cars is just a state of mind. If you want to believe that your 1999 Toyota Corolla is actually a Rolls Royce, we’re all for it. You don’t even need to add any decals or decorations to try to pretend that your car is a Mercedes — the fantasy is absolutely enough. Let’s be honest — most of us can’t afford to go to live sporting events because they’re way over-priced. But, we can pretend that we’re going to live sporting events for our friends online. Adulthood is about pretending that we can afford events that we really can’t. 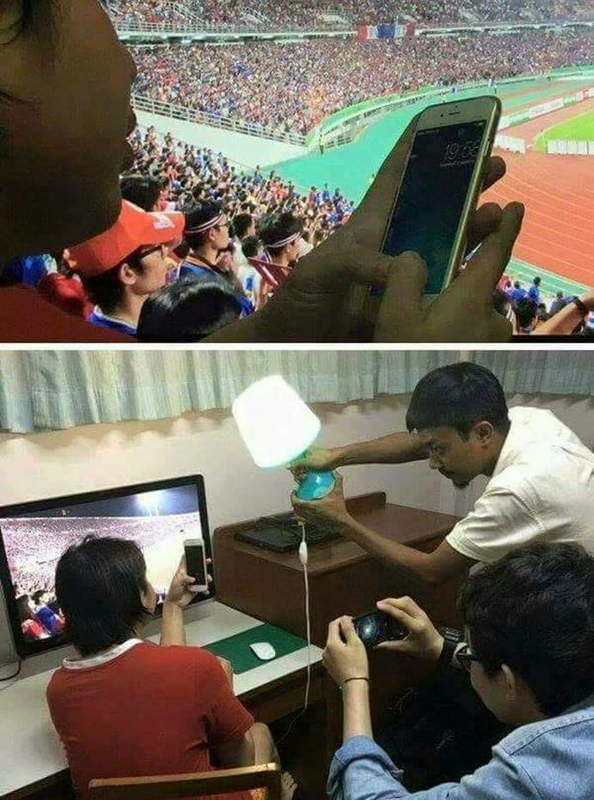 It’s about enjoying the atmosphere from the comfort of your own home. Sometimes we just need our mom to put us in our place. She’s really the only person who can publically humiliate us by calling out our lies and we won’t disown them. Faking an injury is one of the classic ways to get attention from your friends, but this mother is having none of it. Just ahead, a picture that proves that you have to check your surroundings before taking a picture with sunglasses on. It gets awkward. Adulthood is about doing the absolute bare minimum to get by. It’s about finding the shortcuts for everyday tasks and exposing them. You have no energy to spare once you get to adulthood, so you need to use it wisely. This girl knows the necessary life hacks. Relaxation is a mindset and so is being on a beach. I don’t care what the haters say — this is absolutely normal. The only problem with this is that eventually, this blissful beach bum is going to realize he’s actually just laying on a big ant hill with dirt. If you’re going to lie about your whereabouts and also take a picture, please take a second look. Reflections don’t lie, and unless your buddy has luscious blonde hair that even the fakest Instagram model would be jealous of, you’re out of luck on this one dude.Coming up, a makeshift porch or lack of air conditioning? You decide. It’s basically a fail-proof system to post a picture to Instagram. There’s literally about 17 steps you have to consciously take in order to throw up a fire picture for the ‘gram. Look, it’s a good picture with great lighting. Don’t be ashamed to post a picture that you think looks good. Too many people are getting shamed for posting more than once a week, but there shouldn’t be any rules. Nothing screams being an adult quite like combining Goldfish and Mountain Dew. Cooking when you’re an adult is an experience that most of us wish we didn’t have. Instead of learning calculus, we should be learning how to cook. We should be learning the food combinations that will tickle our taste buds. This is what happens when you can’t afford air conditioning because your house is a literal sauna. When it’s colder outside than it is inside your house, there are some serious problems. Also, when you don’t have a porch, there are some serious problems as well. Coming up, a pregnancy test that will absolutely confuse you and scare you at the same time. So we need to call the CIA immediately to have this girl investigated. She’s either the next Stephen Hawking or she’s sent from outer space. The way that she can transform her body is absolutely incredible and not human. If a person’s forehead expands 16 inches after the flash of a camera, that’s some Men In Black stuff. We see you, Colonel Sanders, you’re not fooling anyone. Yes, you’re a little bit more subtle than Ronald McDonald, but not by much. You’re the silver fox we all need and love. It’s nice to know that the owner is actually willing to eat his own food. That’s a really good sign. You take a pregnancy test and this comes up. Do you a) call NASA because it looks like your baby is going to be an alien? Or do you b) call up TLC because whatever is about to come out of your body is going to NEED a reality TV show? Tough decision. It’s really expensive to buy a car nowadays. Young adults have to find different forms of transportation because their student loans are incredibly high. This guy took a toy Hummer and put an actual car battery on it. This thing is the future of Millenials, and we’re all for it. It’s actually astonishing to see just how relaxed some bouncers are with IDs. Some places you can literally give them a picture of an alpaca and they’ll let you in. On the other hand, some bouncers require 19 pieces of ID and 16 familial references just to get into some crappy dive bar.